I've lived in Galway for nearly 25 years, and in that time the most wonderful gems have passed me by, barely noticed in the hustle and bustle of everyday life. It has taken my urban sketching hobby to open my eyes to the glory that's all around me, right here where I live. 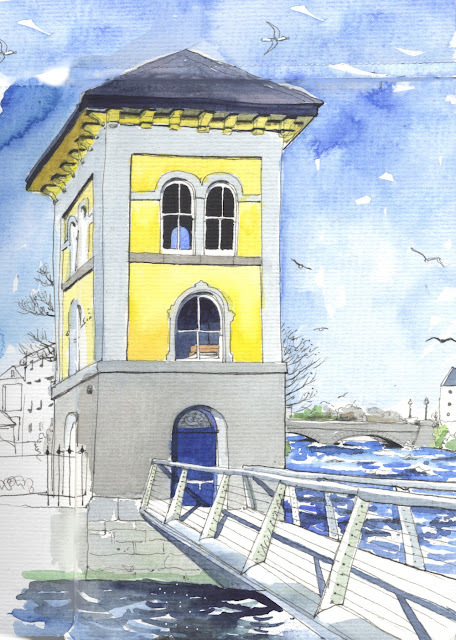 Galway's Fishery Watchtower is, or was, just such an unexplored treat. Walk down Quay Street in Galway City. through the throng of visitors, buskers, workers, students and the occasional vagabond and you come to Wolfe Tone Bridge, which crosses the rushing, racing River Corrib. After the intensity of Galway, your immediate sense is one of relief, as the wide open space of Galway Bay opens up to your left. At the foot of Wolfe Tone Bridge there's a little walkway, spanning a few quieter metres of the River Corrib. The walkway leads to the Fishery Watchtower, a very pretty yellow building, designed in an Italian style that was popular at the time that it was built in 1853. Two brothers by the name of Ashworth, Quakers from Lancashire bought the rights to the stretch of river which the Watchtower overlooks. The river was rich in salmon, trout and eels, and the brothers built the Watchtower to monitor stock levels, poaching activity and even to hang nets out to dry. They were not synthetic then and could rot - the Watchtower has doors or windows on all four sides, allowing for a current of air to pass through. I'd never darkened the door of the Fishery Watchtower until a few weeks ago. Driving past, I noticed that the door was open, and I had two hours before an appointment. As any urban sketcher will tell you...this is an excellent state of affairs! I crossed the little bridge and went inside. Two friendly guides greeted me, and explained that the Watchtower is now a museum dedicated to Galway's fishy past. There are nets and rods of all types, a model of the Fisheries and photos of Galway in times gone by. My favourite was one taken in about 1913 of a proud-looking young woman dressed in a bright red cloak, covering every bit of her save her face. The photo was taken by two Frenchwomen who were travelling photographers, and I doubt that the open, relaxed expression in the face of the subject would have been there if the photographer had been a man. I only think that because her expression was so noticeably different to most of those I've seen from the early days of photography. The two guides were really helpful and didn't mind me getting out my folding stool and sketching for a while. You can see from the picture of the tower above that the building is tiny. It seems even tinier on the inside, so it was very accommodating of the guides to budge over a little for me to draw. 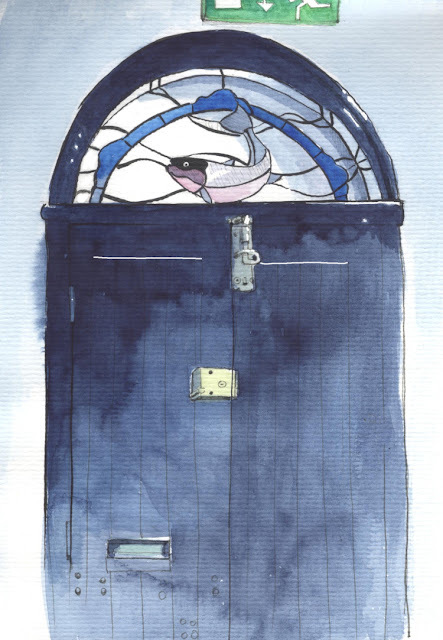 As soon as I looked up at the entrance door from within, I wanted to sketch the skylight above the door. I loved the stained glass, through which the morning sun streamed, illuminating a salmon and making it glow. I returned a few days later with the intention of painting the beautiful view of the Claddagh and Galway Bay from the top floor window. It being Galway, however, and winter at that, my plans were thwarted - it rained heavily all day, so that the view from the window was just a grey haze, the pedestrians crossing Wolfe Tone Bridge mostly invisible under huge umbrellas from my position far above them. So I looked around at the understated taste of the top floor display, and found my vantage point easily. 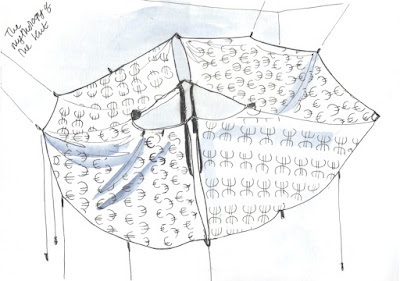 The long brown tube in the centre of the sketch is an eel-fishing net. Many years ago, when my husband Marcel and I were newly married, Marcel did a stint fishing for eels along the Corrib. It was a night-time job, and Marcel said the eels were awful creatures - little red mouths, he said, with sharp little teeth. I believe they're very popular in the Low Countries, where the catch was exported to. I mentioned this fact, my eel pedigree, to the guide. "I've seen cormorants catching eels just there at the bottom of the tower," he said. "They throw the eels up in the air to get them in the right position to go down their throats in a line." "Amazing!" I said. "Do they kill them first?" "Yes," said the guide, "they stab them or whatever." I said this to another guide on a subsequent visit. "Sometimes they're not quite dead," he said. "You can sometimes see the cormorants' throats moving about with the eel wriggling around. They must have some stomach acid to deal with that." The fork on the wall to the right was our answer in times gone by to the cormorants' elegant way to catch eels. 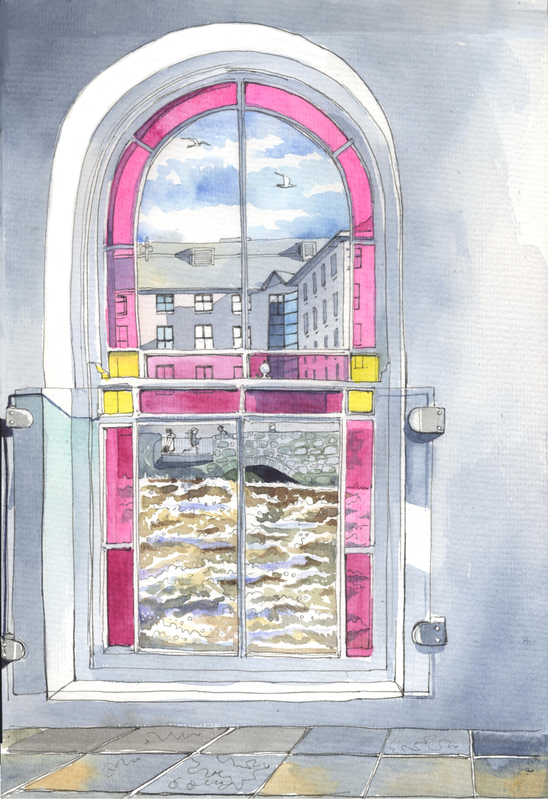 On the ground floor, there's a really spectacular window overlooking the River Corrib. It's in full spate at the moment, a raging torrent hurtling its way from Lough Corrib where it rises. We've had heavy rainfall lately, and to see such an uncontrollable deluge thundering alongside the civilised banks of a modern city seems incongruous...as if we are only fooling ourselves that we're in charge. Walking past it last night with my fourteen-year-old son Paddy was almost shocking. We looked over the bridge and peered at the boiling rapids in the dark, a few feet from where we stood. "It looks...so inviting," said Paddy. I know what he meant. It's that crazy half-feeling you get of throwing yourself in that you sometimes get looking over the edge of a ferry. "You'd last about three seconds, you know that," I said to him. There is no way you'd get out alive the way it is at the moment - and to think that in my youth I kayaked down the Corrib, past the Spanish Arch into Galway Bay, just the once, under no supervision whatsoever. I was a novice, and an experienced kayaking friend told me it was madness. Back to the tower: I very much wanted to sketch the beautiful stained-glass window that overlooks the rushing water. The window is original, although a couple of the pink panes had to be replaced. You can tell which are the original panes - they are the ones with the more delicate, paler shade. One of the amazing group of sketchers from around the world, with whom I'm in touch via Facebook and so on, astounded me with a comment. "Is that Opera Pink by Daniel Smith?" she asked. I had to fetch my tube and check - indeed it was. I was amazed that someone could know their colours so intimately. Furthermore, she finds it hard to get the colour where she lives, making it even more impressive. I should send her a tube just for her cleverness. Or Daniel Smith should. A strong sense of time surrounded me during my visit to the Fishery Watchtower. It's wonderful to see oneself as a small, insignificant being on a long, long thread of history. I look forward to discovering more hitherto-unknown wonders that have been part of the fabric of Galway for centuries...and sharing them in words and pictures with you. Entrance to the Fishery Watchtower is free and well worth a visit. Make sure to check the winter opening hours, as they're a little sporadic at the moment. I am in the unfortunate position of visiting our local hospital frequently. I'm not ill, but I accompany someone who is. 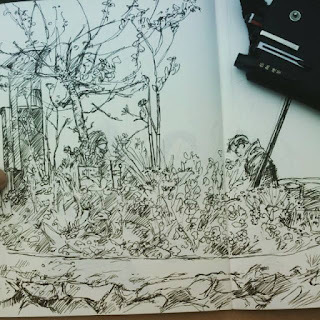 The waits are long and so I occasionally sketch. Other than in hospital, I haven't had many chances to sketch of late because I have to use my time productively (you don't get paid to sketch) but luckily there are always gaps in the day when you get the chance. When I sat down to sketch this one of the café in University College Hospital, Galway, I felt a frisson of excitement knowing I had an uninterrupted hour ahead of me. It says a lot about the intensity of my life over the last two months that I had a wonderful feeling of freedom at the prospect of a single hour when no one would need me and I couldn't do any work. 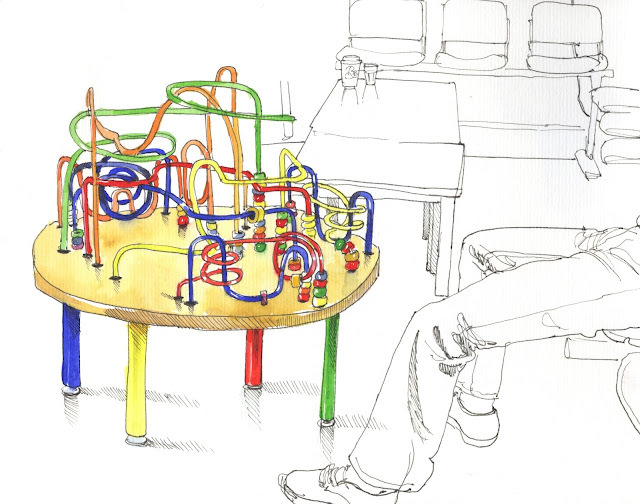 Some farsighted person in the Galway University Hospitals Arts Trust has allowed a very talented young man called Finbar 247 to be let loose with buckets of black and white paint in the main foyer of the hospital. When you have real talent, that's all you need. He has made beautiful graffiti-type art on the walls, with slogans and messages about looking after yourself and making the most of your time. I normally ignore people trying to remedy my laziness but somehow when I read Finbar's words I want to get fitter and stay healthy. I loved sketching his work but I haven't done it any kind of justice. You should check out his website of the same name. 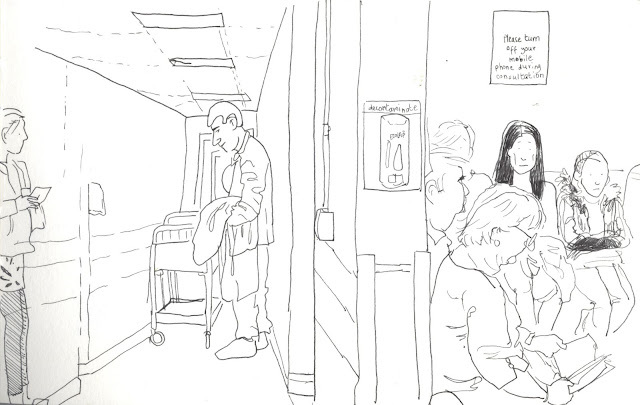 A mix of medical staff, patients and visitors file past at speed. The ground floor of the hospital resembles a very busy train station with a disproportionate number of people in pyjamas or aqua-green uniforms. The ill people move very slowly and the medical staff stride along. Unbuttoned white coats billow past, their wearers like low-key superheroes, which of course a lot of them are. Two men came to sit at my table. They were chatting in Irish, which I understand for the most part as not only was it drummed into me since I was 4 but my kids attend a Gaelscoil and I get to speak it quite a bit (very badly, usually ending somewhat pathetically in English, having failed to get my point across well enough). Like many well-educated Irish people I speak one or two European languages but Irish isn't my strong suit, despite the decades of enforced learning (we had no choice). I love it now, and I was really hoping the men who sat down would strike up conversation. One was too ill to talk much. His younger companion was really sweet to him, trying to persuade him to eat a sandwich and have sugar in his tea. 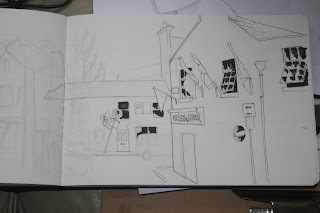 I practiced my Irish sketching-related phrases in my mind but in the end the younger man just spoke to me in English and when I replied in Irish he acted all confused. This happens a lot. I say my piece in perfect Irish - I am Irish, for crying out loud - and there's an awkward silence, followed by English. As an amateur linguist I do get it, but it's a bit annoying nonetheless. 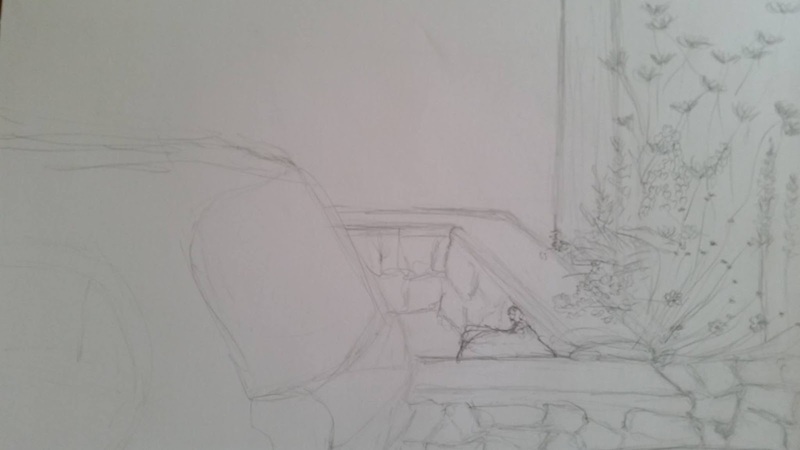 Here's a bit more detail of my sketch. 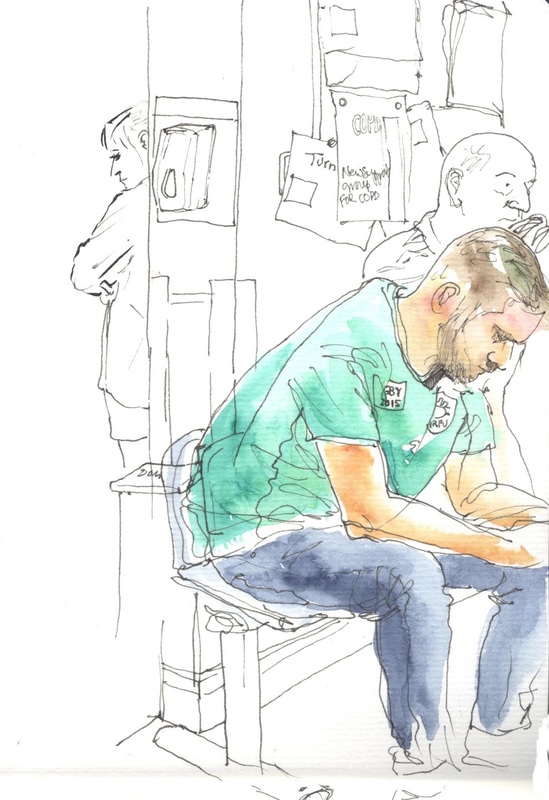 And here's a sketch from before our dreams of Rugby World Cup glory were dashed. This young man was wearing a RWC shirt. I got a silly kick out of using Phthalo green undiluted as I never use it like that - nothing is that colour in nature, except maybe the sea in Mauritius, which I know because I painted it lots of times. This one is just a line drawing but it got me out of my head for a bit. I'm getting quite used to drawing hand-cleanse dispensers. Their angles are a bit funny so I won't master them for a while yet. 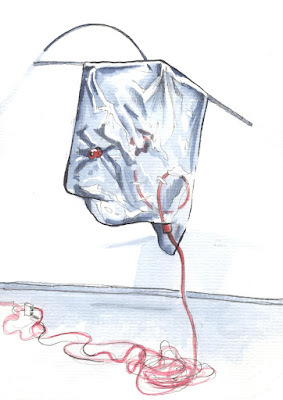 I also did one a few days ago of a lady receiving an iron infusion but she was snoozing away in blissful ignorance of the stupid eejit with the paintbox manically scribbling her likeness as she slept. I will allow her her privacy and not post the sketch. So there you go. 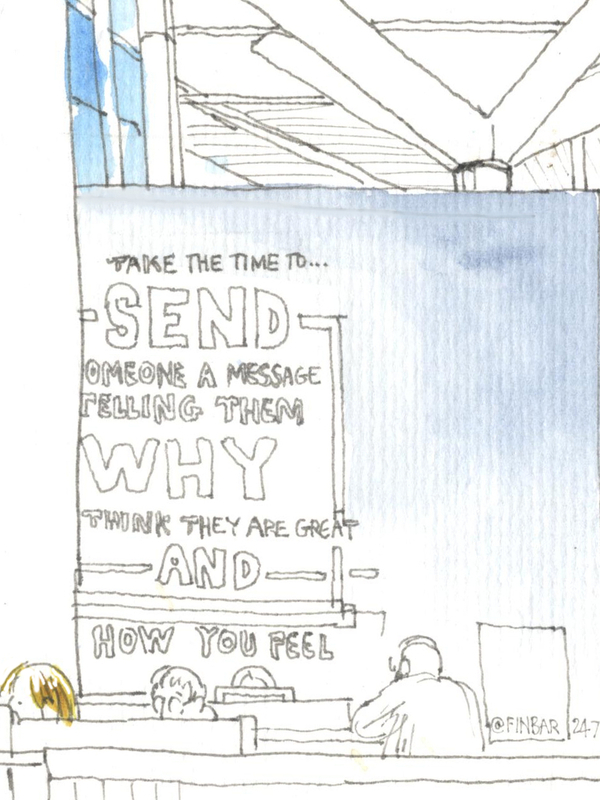 Our health system could do with improvement on many fronts and you can get very stressed in our hospitals, what with the waiting, the worry and all. 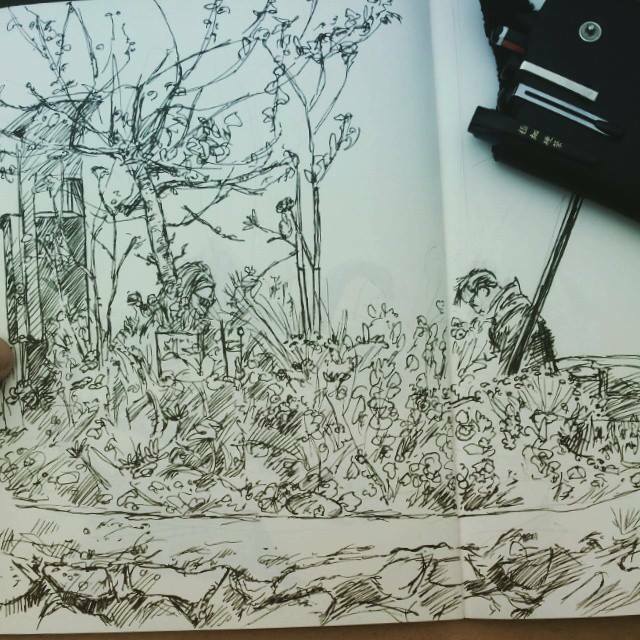 Hospital + sketching = calmer me. 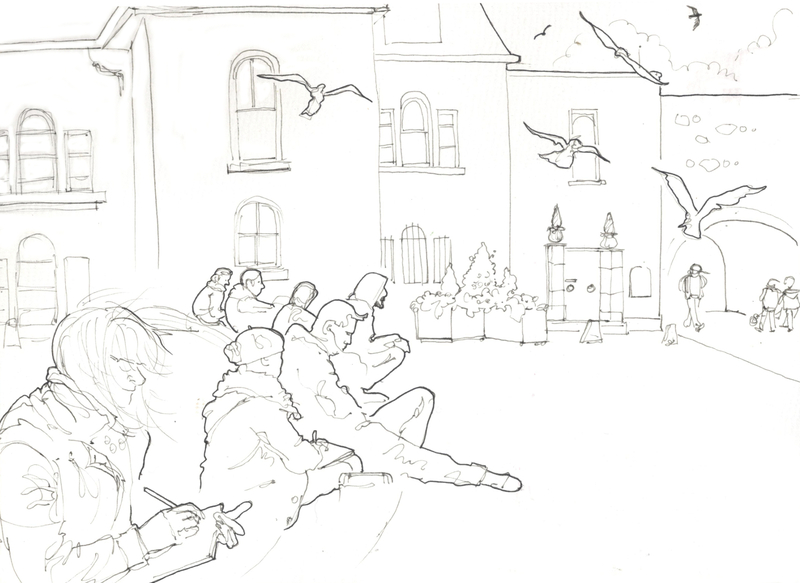 When you think of plein air painting, Galway may not be the first town that springs to mind. You're more likely to conjure up a sleepy Italian village, or maybe the French Riviera. But, even in November, Galway is perfect for a different type of outdoor painting. 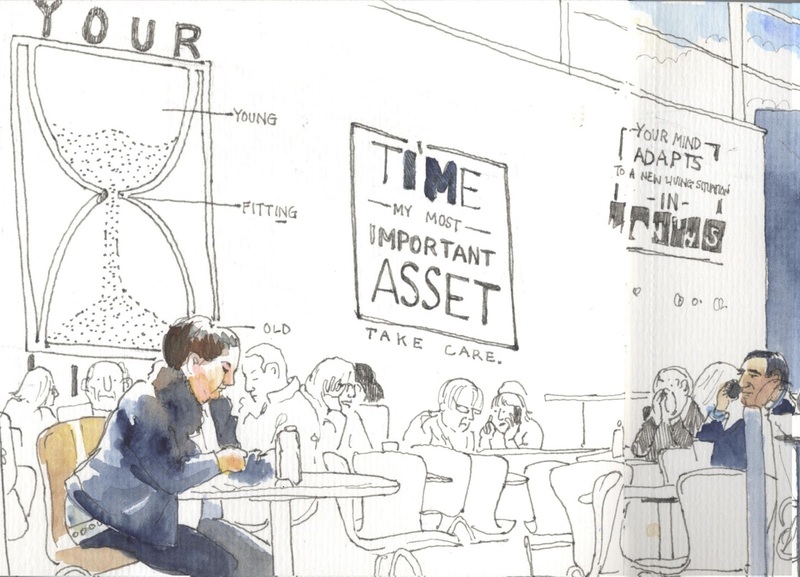 A couple of weeks ago I joined some sketchers for a day's urban sketching. The weather wasn't perfect for it, being cold and a bit on the damp side, but luckily we were made very welcome in St. Nicholas' Church, a 14th century Anglican church in the heart of the city. The choir was practising for Remembrancetide, a concert of movements from Brahms' German Requiem, to be held the following evening. 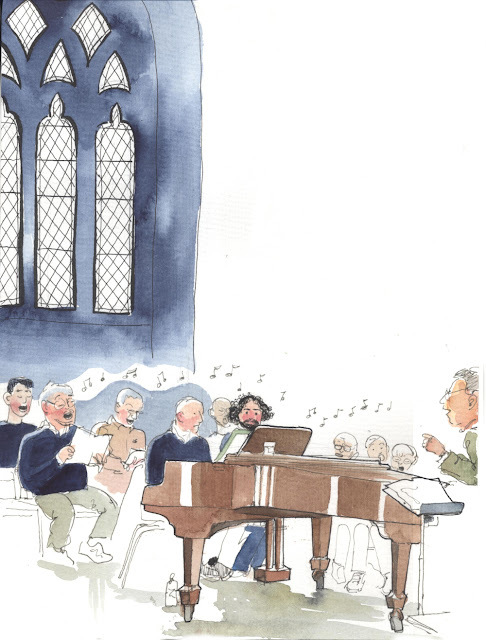 I was in the extremely fortunate position of sketching them while they sang, the renowned acoustics of the church lending wings to the choristers' voices, which soared in stunning harmony. The choir master, Mark Duley, was an inspiring leader who coaxed exquisite responses from the singers. Visitors to the church milled about quietly, evidently delighted with their serendipitous timing. They wandered happily through the music-filled church, soaking up the tranquillity of the moment. A nice hot cup of tea beckoned and the next stop was the Kitchen Café in the Galway City Museum building, around the corner from the Spanish Arch. The atmosphere was lovely, very relaxed, despite the fact that there was barely a table free. 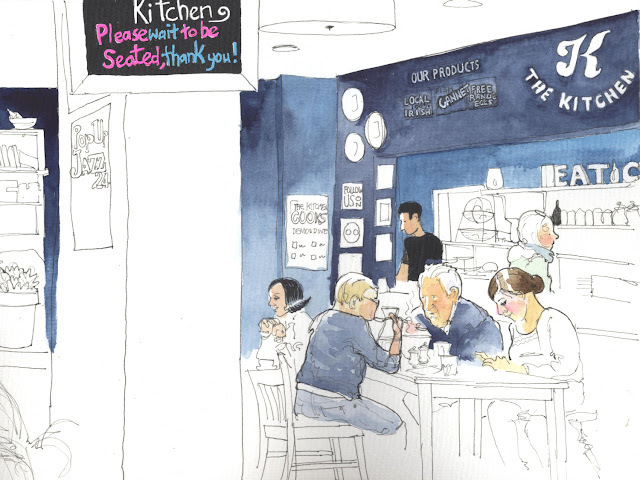 I took the last empty place and settled down to sketch, and was immediately asked for my order by a smiling young waiter. Within a few seconds I saw the person I wanted to sketch first, a beautiful girl with peaches-and-cream complexion who smiled as she communicated with someone on her phone. I was about to paint her jade-green cardigan, but when I looked up she had gone. She reappeared to my right a few seconds later...in an apron. She didn't mind at all. “I'm honoured that you drew me!” she said. Along with the smiling colleague who was serving me they were two of the friendliest waiters I think I've ever encountered. 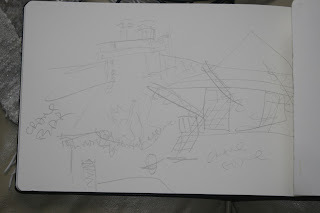 Then my drawing came to an end as I heard a jolly “Hiya!” - it was my friend Ailve, who'd been in town shopping. One of the perks of living in a town that's not too large is that you're always likely to bump into someone you know. The weather is getting worse, but Galwegians don't pay any attention to that. I won't either, and I'll continue to sketch our beautiful city throughout the winter months – and beyond. The Tulca Festival of Visual Arts takes place in Galway every November. it consists of two weeks of contemporary art exhibited in lots of venues throughout the city, from galleries to public buildings. You can find exhibits in University College Hospital and in the James Mitchell Geology Museum, as well as in more well-known gallery spaces around town like the Galway Arts Centre, Nuns' Island Theatre and more. The old Connacht Tribune print works on Market Street is the main gallery of the festival and was where the opening was held. On opening night I braved the cold, wind and and rain to attend, with the intention of sketching what I saw and soaking up the atmosphere. The exhibition is called Seachange and aims to draw attention to climate change - and the concomitant disappearance of islands - using the mythology of Hy-Brasil as a motif. The exhibits all referred in some way to the fragility of our existence here on Earth. It's a sort of make-believe sunken island off the south-west coast of Ireland...but any more than that and I'm in unknown territory. At first the crowd was quiet and well-behaved but the volume rose as the wine and beer began to flow. The dress code was Arty: floor-length black leather coats on some of the gentlemen, opaque black tights for the ladies, black trousers and jackets for nearly everyone. Scarves were worn with aplomb. A man lay down and did some impromptu yoga - you can just about make him out behind the group on the left. Another man struck a funny pose and asked me to draw him, which I did. 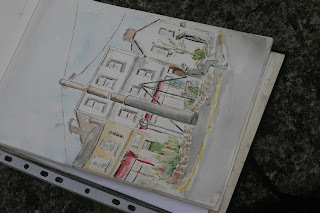 I recruited a very pretty young lady with huge blue eyes and blonde curls to Urban Sketchers Galway: all she did, poor creature, was admire my sketching bag (plus she had had one or two by then) and I wasted no time in telling her how she should join us. 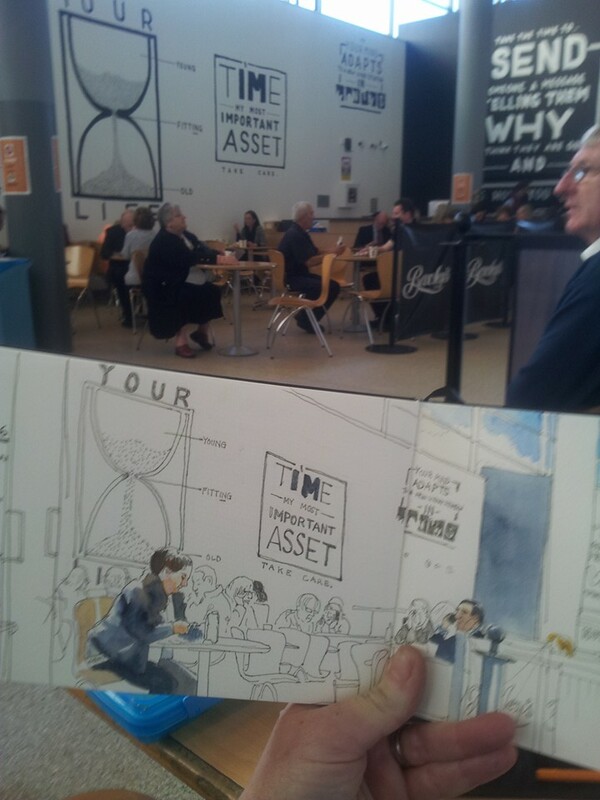 Over the course of two days and in two of the venues I drew some of the exhibits. I must ask for tolerance in my interpretation: I was inclined to cynicism, and I'm on the opposite end of the art spectrum (I interpret nothing, they interpret everything), but I did try to get help with interpretation, from no less a personage than the curator. Nonetheless, I wasn't always the wiser. "It's a sort of superhero cape," she said. "A place of shelter and protection. 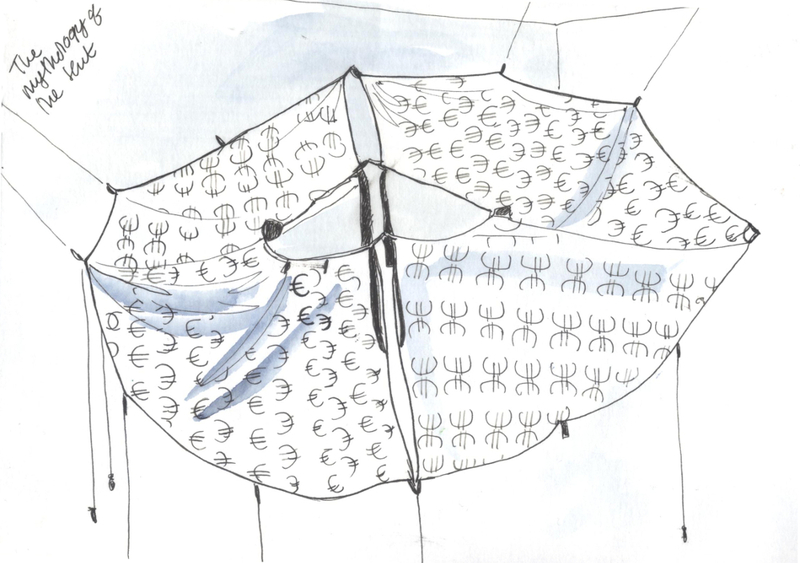 The euro symbols refer to the collective assumption that that currency would save us." Further reading on the web suggested that the piece was supposed to appear to levitate, a bit like a distant island, and indeed the suspension lines were so fine as to be invisible. The next piece was about a nuclear holocaust, or more accurately, about a government leaflet that was circulated in the 1960s. This was part of a series of pieces called How Will I Know When To Go Indoors? and it was by Dennis McNulty and Ros Kavanagh. I didn't find out exactly what it meant, although I did try. To give you an idea of scale, it's about head-height at the top. The next day I called into the Galway Arts Centre on Domick Street to see what was on offer there. 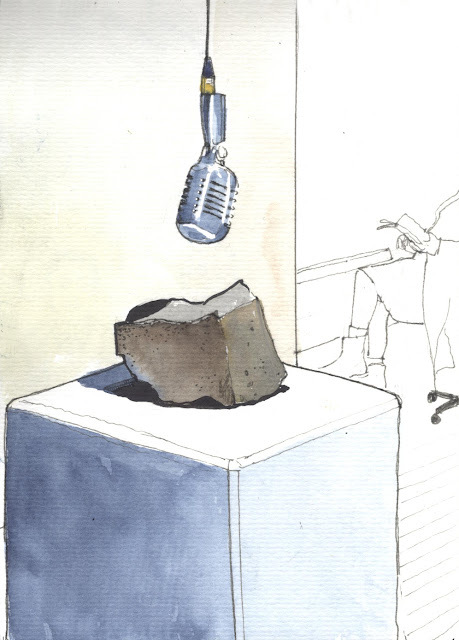 I was very taken by the piece I drew, for no reason other than I liked the way the microphone hung over the rock. I liked the vintage, shiny look of the microphone. Naturally, the rock was silent - now. There was a recording of just such a rock type being formed...at the bottom of the sea at the Mid-Ocean Ridge in the Atlantic Ocean. The rumbling noise it made was very soothing. The piece (and its companion, a short piece of film) referred to the demise of another imaginary island called Nuuk Island. I looked it up and Nuuk is still part of Greenland, so I'm confused. The artist was called Anaïs Tondeur and the soundtrack to her film had some lovely, very French piano music. I was there two days after the Paris atrocity and I welled up for all things French...I lived in Paris many years ago and was in love with the place from the moment I arrived until the moment I left a year later. The woman you can see reading in the background was manning the desk. I asked her if she could help me interpret the exhibition. She did her best, and then recommended a piece back in Market Street. "It's called The Water Glossary," she said. "It's a collection of archaic words for weather, and water, and the sea and that kind of thing. The idea is that language is intimately connected with climate and psyche." She was speaking my language, so to speak, as I am a dilettante linguist and have strongly-held but ill-informed opinions on that sort of thing. It got better. "It takes the form of a booklet. It's displayed in the gallery and there's abench next to it - you can sit and read it," she said, "at least I think you can, and you can buy a copy too." lá idir dá shíon: a day of unseasonably dry, warm and bright weather. In the middle of the wet harsh days of Irish winter, meaning day in between two weathers. These descriptive words about weather and rain and clouds conjure up so many snippets of my life, from early childhood onwards. Our climate stamps us with an indelible mark and it's one of the things we long for when we're far from home - at least, I do. Once, I leaned out of the window in the Wicklow hills, on a September night, having returned from a few weeks in the desert of Los Angeles. I wonder is there a word for the gentle hiss of rain accompanied by the distant bleating of sheep, with honeysuckle on the air? I had no idea what to expect from Tulca 2015. I think some of my prejudices about contemporary art have fallen away. All it took was one or two pieces to make me think afresh about art - and to remind myself that there's room for all of us. Tulca Festival of Visual Arts is on until 29th November. Details from Tulca.ie. 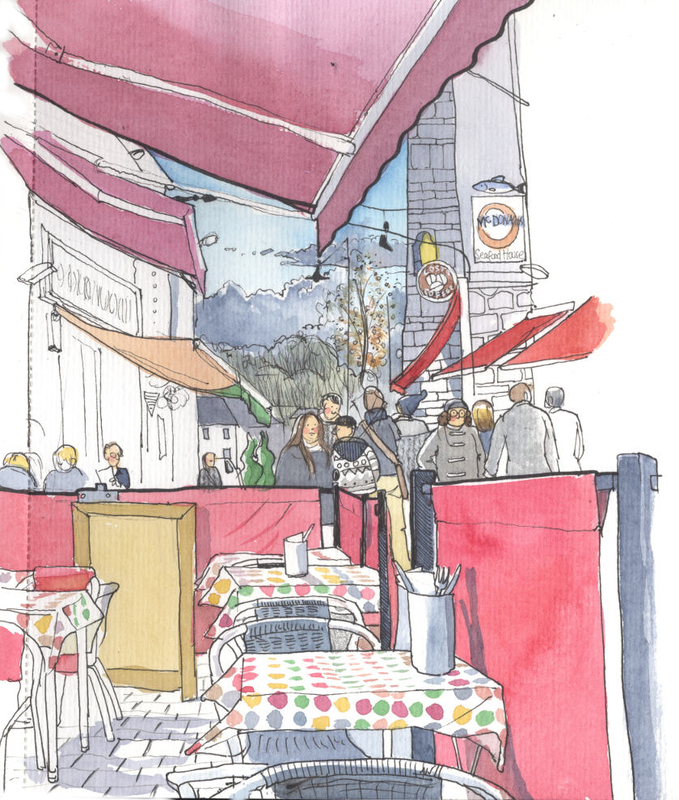 The weather has been atrocious here in Galway all summer, so we've been a bit too cautious to go out Urban Sketching, but we're going to do ou best to rectify that and get some done in what remains of the bright months! Keep an eye peeled for a gathering in August and September at least. Down with hospitals! You spend ages and ages waiting to be seen, it's impossible to find a parking space, you're there for unpleasant reasons and you have to use those special hand lotion dispensers every twenty minutes to keep your hands germ-free. Recently I had occasion to take my elder daughter into UCHG (University College Hospital Galway), or The Regional as I think the natives call it - you'd think I'd know by now, after 24 years in Galway, going to university next to it for eight years and giving birth to three children in it. But there you go. Life passes, and these days I'm there for reasons less pleasant than welcoming a teeny little human into the world. I heard Leo Varadkar, the health minister, say today that they are hoping to reduce time spent on a trolley in a hospital corridor to 9 hours. A month ago, my daughter spent 48 hours on a trolley in a corridor. By corridor I mean a narrow passage in Accident and Emergency, along which the public came and went all day and all night, and along which everyone from babes in arms to old men were trundled in terrifying states of repair (poor things). 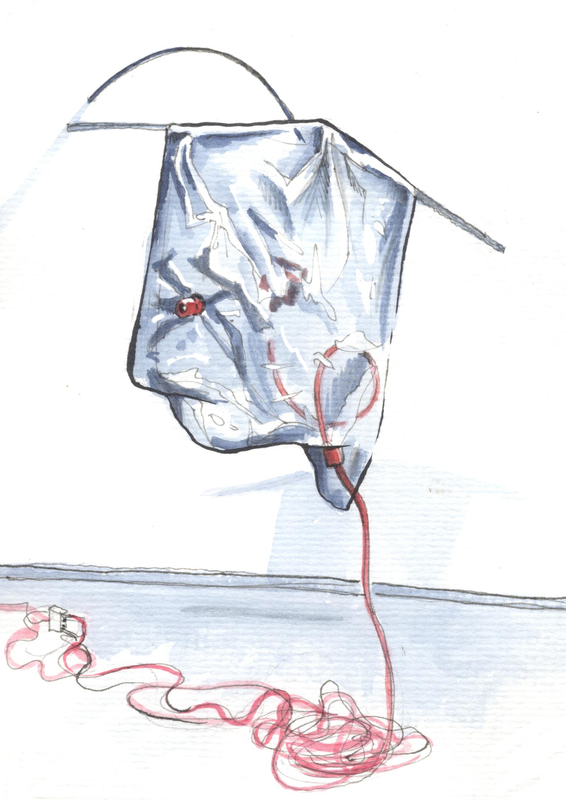 We were cheek by jowl with pneumonia, gangrene, a chainsaw accident and other such time-to-panic situations. My fifteen-year-old daughter wasn't as badly off as some of them, but she was in terrible pain. I found out after two days that if my husband or I had left her alone, the hospital would have been obliged to find her a nice private spot, but they omitted to tell us that until after they'd found her a room. Eventually, they found her a bed in Paediatrics, even though she is technically too old for it. This was a blessing in disguise, for although it meant her doctors didn't visit her as often as they would have otherwise (Paeds is a long hike from the general ward), she was in a nice environment full of children and the staff were all very kind. We spent the next week with her there. There is nothing like driving your child home from hospital when you've been told by your consultant that you can leave. I did it once before when my son was five, and that Easter Sunday was the most beautiful, the sunniest, I have ever experienced. She's much better now, thank the stars, but we had to attend a follow-up appointment the other day. We arrived at 2.20 and were seen at 5.00pm. The waiting room was full when we arrived but we were second last to be seen. My daughter's patience - not great at the best of times - was sorely tested and, as a direct result, so was mine. She badgered me and complained the entire time and so in the end I pulled out my sketchbook. 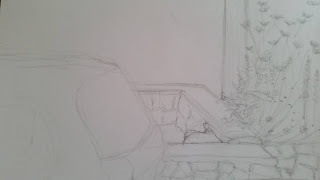 From the minute I started to draw, I forgot about my surroundings, the cross voice in my ear (there wasn't much I could do to hurry the staff up) and lost myself in peace.